Host multiple Kontakt instruments inside a single VST instance of Kontakt. Map each Kontakt instrument to separate Live MIDI channels. Receive stereo audio from each instrument on separate audio tracks in Live. Configure Kontak’ts Aux sends so you can hear them in Live. 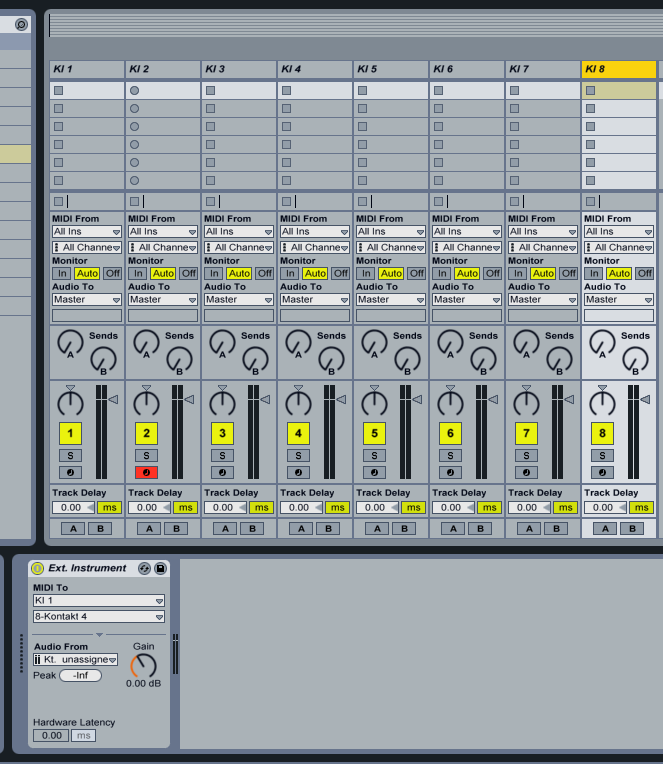 Save the whole configuration into a preset you can drop into any other Live set later on. You only have to follow these steps once! 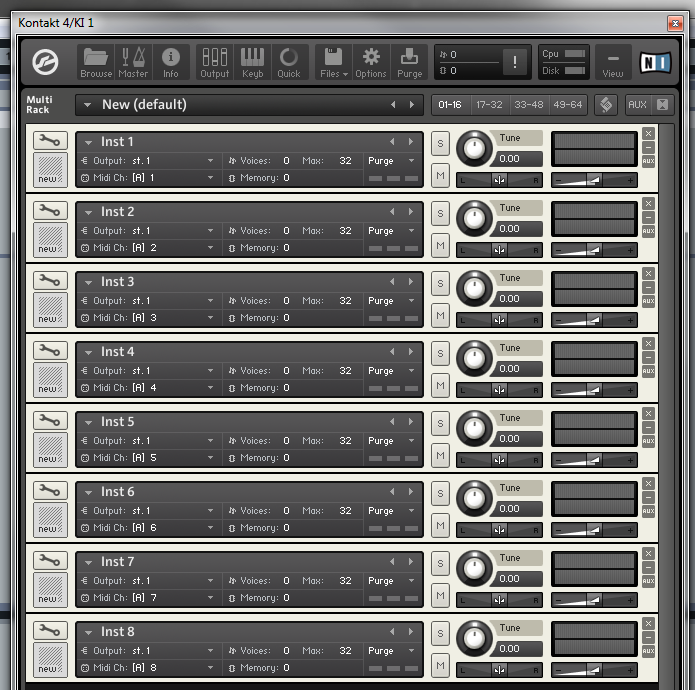 If you are a Kontakt owner, you may have noticed the “8out” and “16out” flavors of Kontakt in your VSTPlugins folder. Those are limited versions of the plugin, I presume to conserve memory/CPU. We’ll need the one that’s just called “Kontakt 4,” which exposes up to 32 audio outputs. Even though Kontakt exposes dozens of outputs through the VST interface, Live 8 seems to have a problem displaying all of them, which will prevent us from being able to add support for all four Aux buses and still have stereo support for eight separate Kontakt instruments. We’ll only be able to set up the first 3 aux buses in this tutorial. There are other ways you can route your outputs, depending on what you need to achieve. Just consider this a starting point. Insert a new MIDI track in Live and name it KI 1 for Kontakt Instrument 1. 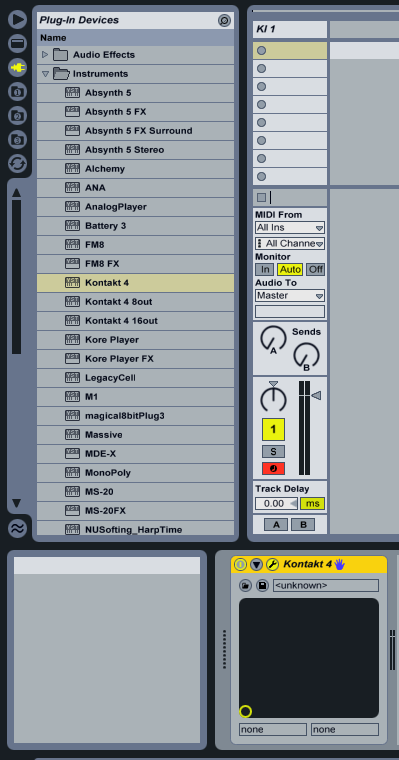 From the Plug-in Device Browser, drop the “Kontakt 4” device onto your track. (Ignore the 8out and 16out versions; they don’t have enough outputs for what we’re going to do.) After a few seconds, Kontakt should open up. The first MIDI track. Click the images in this post for a close-up view. In Kontakt, start with a new, empty multi (Files > Reset multi). Select Files > New Instrument to add an empty instrument to your multi. Name the first instrument Inst 1, the second one Inst 2, and so on until all instruments have uniquely numbered names. Click Output in the control panel to show the Outputs window if you can’t see it already. 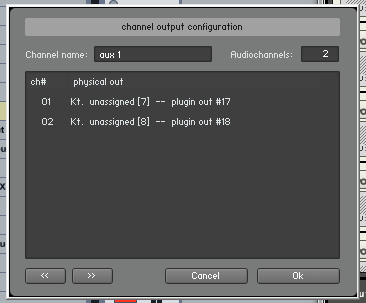 In the Outputs window, click Presets / Batch Configuration > Batch Functions > Clear output section and create one individual channel for each loaded instrument. 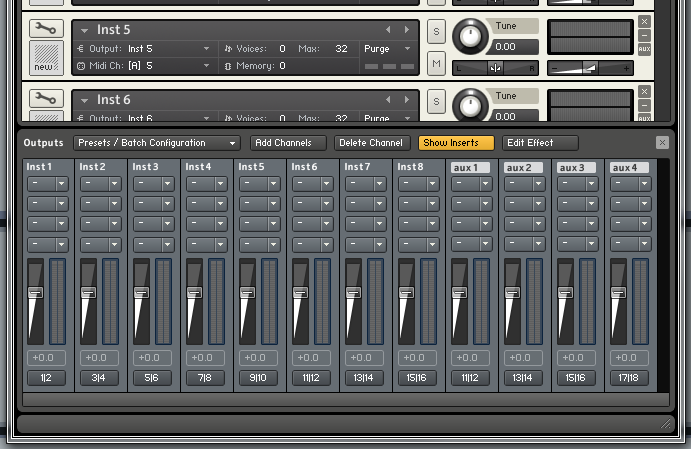 You now have eight separate stereo outs, with their plugin outputs in consecutive pairs, from 1|2 through 15|16. Also note that each of the instruments you added to the multi has already been assigned to a different output. We have to fix the aux outputs next. As you can see in the above picture, the Aux port assignments now overlap with the instrument outputs. (They’re still mapped to 11|12-17|18.) Fix this by clicking the button on the bottom of each fader strip and choosing different “physical out” options. NOTE: Things start to get confusing here. The port names you get to choose from are very misleadingly named and numbered. For your aux 1 bus, choose “Kt. unassigned ” and “Kt. unassigned ” for channels 01 and 02, respectively. For aux2-aux4, do the same thing, assigning two increasingly-numbered “Kt. unassigned” ports to your buses. There is a chart later on that tells you which ports to pick for every bus. Also, if you are prompted to close and re-open Kontakt, just ignore that for now. The output names won't make any sense. Just trust me on this. If you did the last step right, the output pairs along the bottom of the Outputs window should start at “1|2” for Inst 1 and end with “23|24” for aux 4. Port assignments when properly configured. It’s a good idea to now click Presets / Batch Configuration > Save output section preset as and save a copy of your output settings. If you plan on using custom multis a lot, you might also consider picking Presets / Batch Configuration > Save current output section state as default for > VST Plugin. 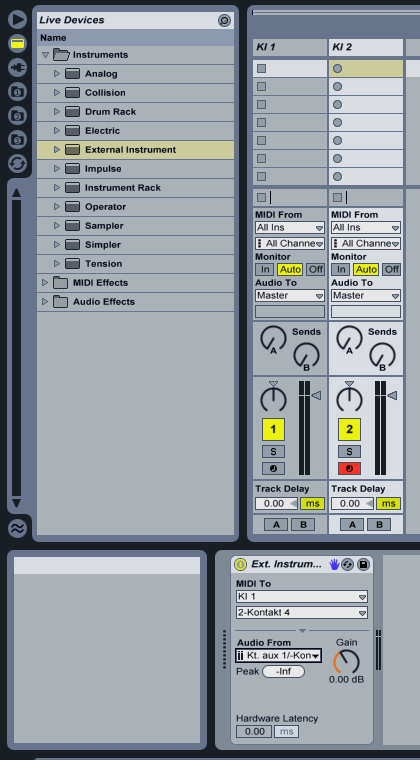 Back in Live, insert a new MIDI track and drop an External Instrument device on it from the Live Device Browser. Name this track KI 2 for Kontakt Instrument 2. On the new External Instrument device, select the name of your first MIDI track (KI 1) under MIDI To. Directly beneath that, select 2-Kontakt 4, because this track is for MIDI channel 2. Under Audio From, pick Kt. aux 1/-Kontakt 4 (it should be the first entry in the list). This is just the output name that Kontakt reports to Live, and can’t, as far as I know, be changed. The first External Instrument track, properly configured. 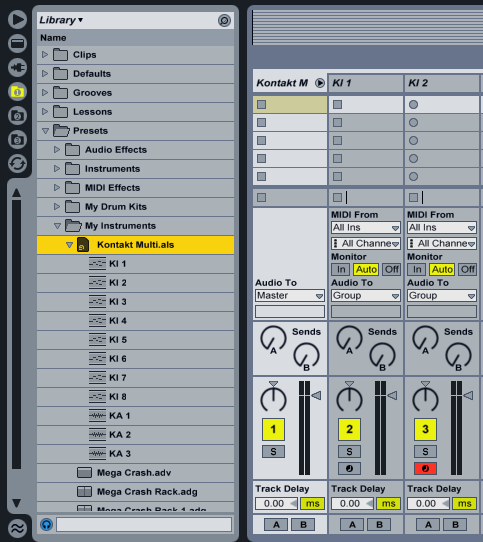 Select your External Instrument track (KI 2) and press CTRL + D six times to create six duplicate tracks. For each of the new tracks do the following: Rename the track, select the correct MIDI channel, and select the next Kontakt audio output. Follow the chart below to see which Audio From option to select for each track. (You can ignore the bottom three rows of the chart for the moment.) NOTE: As you will notice in the chart, once you get to track KI 6 (exhausing the last of the aux pairs), you have to start skipping audio ports, because the ones labeled “Kt. aux” are stereo pairs, and the ones labeled “Kt. unassigned” are mono outputs. This shows the MIDI and Kontakt audio assignments for each Live track. The Kontakt Instrument tracks, once completed. Kontakt has four aux send buses. Unfortunately, due to a limitation (of Live, I think), you will only be able to set up Live tracks for three of them, unless you decide to sacrifice an instrument from your multi. Insert an Audio track (not a MIDI track) and name it KA 1 (for Kontakt Aux 1). For Audio From select KI 1, and below that pick Kt. 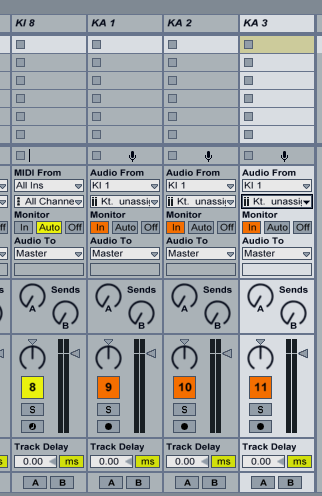 unassigned -Kontakt 4, and then click the In button under Monitor. Now duplicate this track two times, naming the others KA 2 and KA 3. Don't forget to click the In button under Monitor on the aux tracks! Hold down SHIFT while clicking the last track, KA 3, to select all tracks. Right-click one of the selected tracks and pick Group Tracks. Name the track group Kontakt Multi. Drag the group track into one of your personal Preset folders in one of the File Browsers. This will actually save an ALS file (a Live Set) that you can drop into any existing Live Set to instantly have access to Kontakt with all the MIDI and audio ports mapped and ready. The preset is now in my Library, ready for use in other projects. If you’ve done everything right, you can now drag an instrument into any of your 8 slots on your multi in Kontakt, play MIDI on the corresponding track in Live, and you’ll hear the instrument with audio coming in on that same track. Three different Kontakt instruments playing audio on three Live tracks! Also, if you performed the optional Aux steps, you can now send signals to the first three buses in Kontakt and hear them on your KA tracks in Live. Enjoy! My thanks to Solger on the Ableton forums, and JBlongz & Troll30527 on YouTube. Thanks for all your tips. I appreciate it a lot. The DJ Midi Controller Girl! This helped me out a lot, thanks! There is a way to get more than three aux channels...try using the Kontakt 16 out. the 8 out and 16 out is only referring to the audio channels (midi will always be 32 regardless of which Kontakt you use). Hey, this is wonderful. You should be writing the manual for Kontakt, which is not helpful at all. Actually, I can't still I am finished trying to get this going and I am using Acid Pro (though I do have Abelton but am more at home in Acid Pro) and I will assume the basic principles are the same for most all DAWs and I will have to figure out the set up differences. I have been on this for over a month! Have resorted to setting up separate instances of Kontakt in my DAW and freezing them when I am done, but that is not what I really want and still a major CPU issue at times. expect some problems of course, but Kontakt is brutal when it gets pumping. Hope this works but already I am seeing what you're getting at and I just could not get this from the NI manual or other online tutorials. Well done man and if it fails it will be on my head, not yours. But already a glitch. When I try to assign Aux 1 to the unassigned port 7 and 8 as you detail it always goes up plugin ports 25 and 26, not 17 and 18. In the end I have audio ports 1 to 8 with plug in ports 1 to 16, then it skips to aux ports 25 to 32. I have done this over and over and this is what happens. Great tutorial, thank you, Have you figured out how to get 16 mono outs into Ableton? @Okan Gon - I have learned a bit more about both Kontakt and Live, and will probably do a new tutorial about this within the next few weeks. Unfortunately there's some bad news about Live, but I'll go into more detail about it in the post. I am attempting to get more than 5 tracks set up in Kontakt this way. Following this guide does not work for me, because the Unassigned outputs, when set up this way, are only sending a mono signal to the External Instrument. I understand how I could send 2 mono signals this way etc, but I would really like a cleaner approach, as the first 5 tracks allow. and so on for each of their instruments, but I just can't figure out how to do this, so I'm stuck with only using the first 5 channels properly (Kt. st 1, and the aux channels). Nevermind! The answer is that you need to save the setup as the Default section state (under Presets / Batch Configuration) for VST, as you have probably realized by now. @Chris - Yes- in fact, I have a brand new tutorial in the works that's going to cover that fact and a few more. Sorry for the oversight!